and 3 Ops with 156 Squadron. Awards: Mention in Despatches - awarded as per London Gazette dated 13 June 1946, with effect from 20 December 1942. 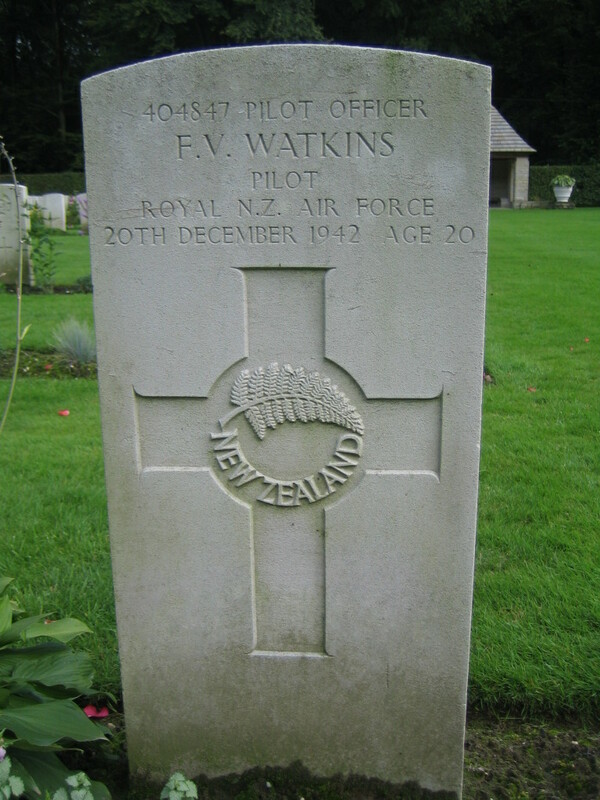 Personal Details: Son of Frank Arthur and Annie Watkins, of Ruawai, Auckland, New Zealand. 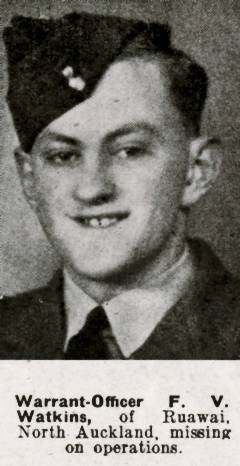 According to the 156 Squadron Operations Record Book (ORB) Warrant Officer Watkins first mission was on the 8/12/1942. The ORB on 26/07/1943, records that F/O WATKINS (Missing on 21.12.42) was appointed to commissioned rank. His final mission, to Duisberg, on the 20/12/1942 took off from Warboys at 18:02. Public Record Office Air 2/4890 has recommendation for a Victoria Cross drafted by the Commanding Officer of the squadron on 20 February 1943 which noted he had flow 29 sorties (170 operational hours). Firstly, it should be appreciated that Squadron Leader Carter himself is an extremely experienced operational navigator, who has on many occasions returned from operations in crippled aircraft, and that the forced parachute descent he made on the occasion referred to is the third he has made during active service in this war. His cool judgement and opinion of the behaviour of his captain on this occasion can therefore be vouched for without any doubt. Warrant Officer Watkins joined this squadron on 1st December 1942 as a specially selected crew for pathfinder duties from No.1 Group, where he had proved himself as an above the average captain. During his service with this squadron he displayed the highest sense of responsibility and absolute devotion to duty. This final record of his unquestionable and unequalled courage in the face of death is considered worthy of the highest award that can be made by His Majesty the King. Finally, it should be noted that from the evidence of this letter that Warrant Officer Watkins displayed the highest qualities as a captain of aircraft. Firstly, he ordered those members of the crew who could be of no further assistance to him to bale out, and then waited until the last moment before he ordered the navigator to bale out, when in his own mind he considered that he would be forced to make a crash landing. It would appear that at no time did the question of his own safety enter Warrant Officer Watkin’s mind. Group Captain Kirkpatrick, Officer Commanding Station Wyton, added his comments the same day. I heartily endorse the Squadron Commander’s recommendation that the highest award be granted Warrant Officer Watkins. It is clear that he went to his death in an attempt to land knowing full well the heavy odds against his doing so in a badly damaged aircraft, in enemy territory, and at night, but hoping that the Bombardier might after all be alive, and that he might possibly effect a landing and thereby save his comrade’s life. This act of unselfish sacrifice, cool devotion to duty and astonishing courage, in my opinion deserves the highest recognition by the award of the Victoria Cross. ED - History has shown that the recommendation was unsuccessful, and I am under the impression that in these circumstances only the MID can be awarded.